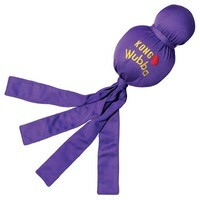 Kong Wubba Classic is a fun and interactive toss and tug toy. Made using durable reinforced nylon fabric covering two balls, the Kong Wubba features a tennis ball on top and a squeaker ball beneath. The long tails make it easy to pick up and throw, and dogs will love to squeak the Wubba as they shake the flapping tails back and forth. This toy is designed as an interactive toy and is not suitable as a chew toy. Please Note: This product is available in a variety of colours which unfortunately cannot be guaranteed. Bought 2 of the xtra large ones of these for our staffie for christmas,yeh she has chewed the tails of them but the rest is still in one piece,with the smaller size that we have bought in our local shops before she has managed to finish them of in less then 30 minutes,and i hasten to add we paid less for the xtra large from here than we do for the smaller ones in our local shop,so maybe buying the bigger size is the way to go,well worth the money,she loves squeaking them. Terrible, my galgo ripped it to shreds within a couple of minutes. Definitely not "hours of interactive fun" here! Waste of money. Excellent highly durable toy. Have had one for 3years and it's still 'alive'. Just bought another for a friend with a Staffordshire Bull Terrier because I know they last. One of the best dog toys, my dogs simply loves, and it lastes a long time.